Published: Oct. 16, 2018 at 12:26 p.m. Check out the best fashion statements from Week 6. 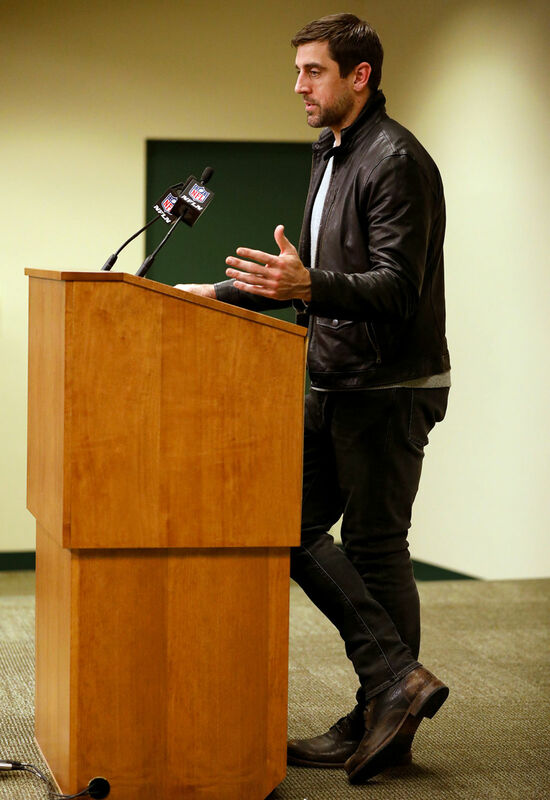 Green Bay Packers quarterback Aaron Rodgers talks at a news conference after an NFL football game against the San Francisco 49ers on Monday, Oct. 15, 2018, in Green Bay, Wis. The Packers won, 33-30. New England Patriots wide receiver Josh Gordon wears Balenciaga shoes as he speaks to the media following an NFL football game against the Kansas City Chiefs, Sunday, Oct. 14, 2018, in Foxborough, Mass. Arizona Cardinals quarterback Josh Rosen waits to speak at a news conference after an NFL football game against the Minnesota Vikings, Sunday, Oct. 14, 2018, in Minneapolis. The Vikings won, 27-17. Kansas City Chiefs quarterback Patrick Mahomes wears buckled dress shoes as he speaks to the media following an NFL football game against the New England Patriots, Sunday, Oct. 14, 2018, in Foxborough, Mass. New England Patriots head coach Bill Belichick arrives to speak to the media following an NFL football game against the Kansas City Chiefs, Sunday, Oct. 14, 2018, in Foxborough, Mass. San Francisco 49ers cornerback Richard Sherman arrives at a news conference after an NFL football game against the Green Bay Packers on Monday, Oct. 15, 2018, in Green Bay, Wis. The Packers won, 33-30. Philadelphia Eagles' Carson Wentz speaks during a news conference after an NFL football game against the New York Giants on Thursday, Oct. 11, 2018, in East Rutherford, N.J. The Eagles won, 34-13. San Francisco 49ers cornerback Richard Sherman arrives at a news conference wearing men's dress shoes after an NFL football game against the Green Bay Packers on Monday, Oct. 15, 2018, in Green Bay, Wis. The Packers won, 33-30. Jacksonville Jaguars quarterback Blake Bortles arrives prior to an NFL football game against the Dallas Cowboys, Sunday, Oct. 14, 2018 in Arlington, Texas. New York Giants quarterback Eli Manning speaks during a news conference after an NFL football game against the Philadelphia Eagles on Thursday, Oct. 11, 2018, in East Rutherford, N.J. The Eagles won, 34-13.